Trying to think from the recipients position is a good start when choosing a present. Who do we know better than our mother? Nevertheless, finding a unique present that expresses the respect and attention held is not easy, but some basic rules will help. Could Mother have easily purchased the item herself? If she could but hasn't, is it something she would want or would appreciate? How much effort has been put into the present? Generally, present with a strong personal component or input stand out and are valued more as the receiver appreciates the effort and attention. Everyone can buy a coffee table book about Spain, but making a photo book about the last family holiday is different and very personal. Usually pictures can make the difference between generic merchandise and a unique mother's day gift. Indulging into the pleasures of picking something special requires some time to investigate ideas. Photo processing services offer a wide range of personalised gift items from calendars, canvases, crystal hearts to photo books and hand bags - all with your own photographs professionally applied. Presents require using imagination and creativity. Combining text and images can convert the useful into a unique expression of creativity and attention to Mom. • A holiday or family photo as a canvas print? 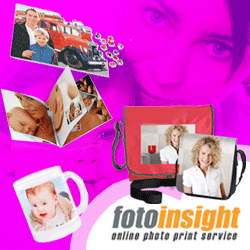 FotoInsight prints digital images onto canvas, stretched and mounted onto a wooden frame. Delivered ready to hang onto the wall and from now to the end of March with 30% discount (voucher code "ART3"). Sizes range from about A4 / 12”x8” (from £24.99 plus p&p) and can be as large as 32”x24”. • Active families who want to remember their holidays will find the photobook printed from your personal digital photographs ideal. With a variety of creative themes and page layouts, these one-of-a-kind photo gifts will help to remember a special trip or photos from every-day moments the family has shared together. For Mother's day (and to the end of March) Printing-1 offers £15 off its photo book printing on orders over £35. • Popular gifts for Mother's day photo gift classics include the a pillow case or hand or linen bag with photo on print. • Laser engraved crystal photo gifts, including crystal picture frames, crystal key rings with LED light, crystal pen holders and crystal photo hearts. The photo crystal items are a sophisticated photo gift for Mother's Day. This year, it’s not what you give but what the gift yields that counts. Good memories and positive emotions are the best return.